The 1980s were a particularly prolific period for Steven Spielberg, who overall managed to maintain a high level of quality in the movies he directed (1941, released in 1979, was an early warning to keep things under control, while Always (1989) was a quiet disappointment best known for providing Audrey Hepburn with her final role). But even with movies like Jaws, Raiders of the Lost Ark, and E.T. already on his résumé, Spielberg really pushed the creative, artistic mojo into high gear during the 1990s. In particular, 1993 was a banner year. That summer saw the release of the mega-blockbuster Jurassic Park. Then the winter saw a whole new milestone: Schindler's List. Another one-two punch of popcorn and drama came in 2005, with War of the Worlds in the summer and the spectacular reality-based Munich in the winter. Now, in 2011, Spielberg's at it again with The Adventures of Tintin: The Secret of the Unicorn (excellent popcorn) and War Horse (excellent drama) being released within four days of each other in the United States. But that's not all. Here are some more double features. The opening chapter of Steven Spielberg’s War Horse feels awkward. It’s looking for a tone, a pace, a direction. It plays like a 1950s Disney live-action family drama. It’s not that it’s bad, but it raises the question as to what Spielberg saw in the story, what the appeal was for him. After all, the source material is a 1982 book by Michael Morpurgo; it’s a children’s book written from the point of view of the horse. Then again, this movie was preceded by a 2007 London stage play which took the book as its basis. That highly successful, Tony Award-winning stage play is currently at Lincoln Center in New York City. In those first scenes, a colt is born and a farmer named Ted Narracott (Peter Mullan, Tyrannosaur) arrives at a horse auction and outbids his landlord, upping his bid from one guinea to 30 for that colt. It’s not the work horse his wife, Rose, desperately wanted him to acquire, but Ted’s ego got in the way – and his son, Albert (Jeremy Irvine in his feature film debut) is immediately enchanted by the new arrival. Unfortunately, they needed a plow horse and now they’re in danger of losing their farm. Their current work horse is getting too old to handle the load. Amid the family farm drama, in which they make an agreement to extend their time to make payments, a nasty storm wipes them clean and forces them to start over. Rose (Emily Watson, Angela’s Ashes) takes her son aside to explain to him why his father drinks; she also clues him into his father’s heroic activities during the Boer War, actions for which he was bestowed a number of honors. While Ted’s a man of considerable pride when it comes to his farm, his deadly duty during the war brings him a sense of shame. Maybe a better analogy for those opening scenes is that the movie’s like a bucking Bronco waiting to break out of its pen. It takes a while for War Horse to find its way, but once the story moves away from that farm drama preamble, things begin to soar. Not only does the story become much more engaging, but the entire presentation takes on a far greater sense of ambition and purpose. Visually, there are some spectacular scenes framed with an immaculate sense of composition. Thematically, the story examines the crudeness of World War I. Those elements come to the fore when the imperial valor of British soldiers, gallantly wielding sabers while charging ahead on horseback, are confronted by the enemy line – armed with industrial age weaponry. The honorable Capt. Nicholls (Tom Hiddleston, Midnight in Paris), a British officer who bought Joey from the farmer, dies in the battle and Joey’s ownership changes hands once again. Therein lies the movie’s magic. Considerably beefed up in its portrayal of the horrors of war, and with key characters fleshed out to a more impactful degree, War Horse the movie – by way of the stage – turns into a sweeping, engrossing epic. Much as the search for one family’s son became the vehicle for experiencing a series of World War II vignettes in Saving Private Ryan, Joey’s travels and changes of ownership become the vehicle for exploring the agony, horror, and tensions of World War I. When Spielberg made Schindler’s List, he commented on the opportunity to capture all of those wonderful European faces on film. Watching War Horse, there’s that same sense. While, much like Schindler’s List, the cast is peppered with familiar faces, David Thewlis and Emily Watson among them, many of the key roles are fresh – or at the very least, less familiar – faces. One of the most engaging of those faces belongs to newcomer Celine Buckens, who plays a precocious farm girl enamored with Joey when he comes into her life. Spielberg knows how to get exceptional performances from child actors and this is one of the best of the best. Her story, along with that of her grandfather (Niels Arestrup, The Diving Bell and the Butterfly), so cut and dry in the original book, takes on a much-needed ambiguity, one that brings the awful contagion of World War I from the highest levels of the front lines to the equally disturbing aspects of property confiscation and personal invasion. Emilie’s story is preceded by that of Gunther, a German horsekeeper who rescues his brother from the front lines. Weaving and intertwining the war efforts of Ted together with the current events of World War, Gunther uses Ted’s Boer War pennant, which Albert transferred to Joey when Capt. Nicholls took the reins, as a visual cue to identify his brother’s backpack in the line of marching soldiers. He put it there to give his brother good luck. And the plan worked well. Trouble is, the brothers at that point became deserters. And they were found. The rotating sail of a windmill moves into view and blocks the sight of the two young deserters being executed out in the open field. It’s elegant filmmaking, the kind of quiet, artful flourish Spielberg bestowed upon grim, grisly scenes in Schindler’s List and Saving Private Ryan. More stories are told as Joey moves from owner to owner, a mere puppet of war. There’s a great, theatrical interchange between a British soldier and a German soldier as they work together to rescue Joey from an entanglement of barbed wire in No Man’s Land. They reveal their individual prejudices in a fairly lighthearted banter, then part ways with a hand shake. They know full well they’re really not that different from each other, but the hell of war will continue. 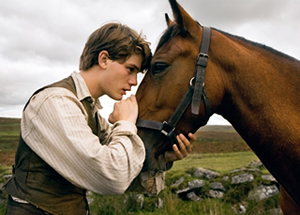 In War Horse, Spielberg has found a terrific canvas to once again visit the horrors and heroics of war. The ending carries shades of Empire of the Sun, showing Albert himself transformed by his own hellish experiences in the trenches, exposure to mustard gas, and the loss of friends on the front line. When Ted and Albert reunite, there’s a new understanding of pride and bravery that’s shared between them. And, as called for by Capt. Miller in Saving Private Ryan, it’s a moment earned.